From his impressive brownstone mansion at the corner of Fifth Avenue and 11th Street, General Lloyd S. Bryce complained to The New York Times on April 13, 1894 about the state of lower Fifth Avenue. There was a push to put a street car track straight up the staid old avenue. General Bryce, formerly a Democratic congressman and the owner of The North American Review, was not pleased with the prospect. Before long, however, Bryce and his neighbors would all give up the fight, fleeing northward away from encroaching "commerce." Bryce's magnificent residence would be razed and, in its place, a grand Beaux Arts apartment building would go up in 1903. 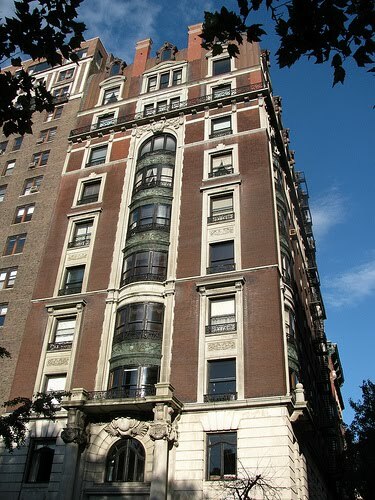 While developers of other luxurious apartment houses at the time gave their properties names to distinguish them -- The Ansonia, The Chatsworth or The Wyoming, for instance -- this building relied on its venerable address: 43 Fifth Avenue. Called "Parisian Apartments," many a full floor, they offered everything an upper class family would need: maids rooms, formal parlor, library, and drawing room. The lobby floor was marble and Art Nouveau bas reliefs decorated its walls. Eleven stories tall with a steep two-story mansard roof, the building was surrounded by a deep dry moat. The wide dramatic steps from the street to the entrance were flanked by stone lampposts. If life in General Bryce's brownstone had been relatively uneventful, life in the new apartment building would be less so. Among the notable residents in 1914 was Chevalier Giacomo Fari Forni, the Italian Consul General to New York. Forni was especially unpopular with "The Black Hand," the terrorist organization that had assassinated Franz Ferdinand of Austria earlier that year. The year before, a bomb had exploded in Forni's office and on September 18 he was clubbed over the head while leaving the subway at Spring Street. On October 18, a bomb was placed in the boiler of 43 Fifth Avenue. Forni was out of town. If the Black Hand intended to destroy 43 5th Avenue, they were unsuccessful. The explosion at 6:00 am, however, crushed the skull of a building employee and seriously damaged the apartments of the first floor. Police Inspector Eagan reported that "A bomb made of dynamite or some other powerful explosive was set off inside of the boiler." Mrs. Berkley Mostyn, The New York Times reported "had been thrown from her bed to the floor, and other tenants told of similar experiences." Apparently the readers of The Times found Mrs. Berkley Mostyn's landing on the floor in her bedroom of interest. The Black Hand never managed to assassinate Forni and things at 43 Fifth Avenue got decidedly better after the scare. Then the celebrities started moving in. In 1946 Marlon Brando was living here with a roommate named Igor. According to Charles Higham, author of the 1987 Brando: The Unauthorized Biography, Igor was a Russian violinist. When Brando decided he wanted the apartment to himself he convinced his roommate to leave by filling his violin with horse manure. 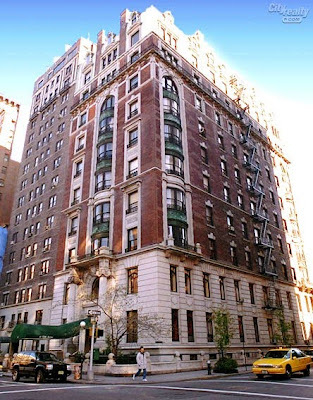 Following Brando's lead other film types have called 43 5th Avenue home including actresses Julia Roberts, Holly Hunter and Jennifer Jason Leigh, along with her husband writer/director Noah Baumbach. Novelist Dawn Powell lived here as did fashion designer Roland Leal. In 1978 the apartment building was converted into coops. Hugh Grant's character lived here in Woody Allen's Small Time Crooks and the building appears in Deconstructing Henry and Everyone Says I Love You. Unlike many other grand turn-of-the-century apartment buildings, 43 Fifth Avenue never suffered extensive neglect or serious disrepair. From the street it looks very much today as it did when Edwardian ladies with ostrich-plumed hats alit from carriages there in 1903. Diana Ross once lived in this building. I know, I vomited in her toilet once. Famous photographer Maury Englander lives here. Did Marlon Brando live in one of the servants rooms on the top floor? I'm not sure where Brando lived where he was here. Maybe another reader has some info. 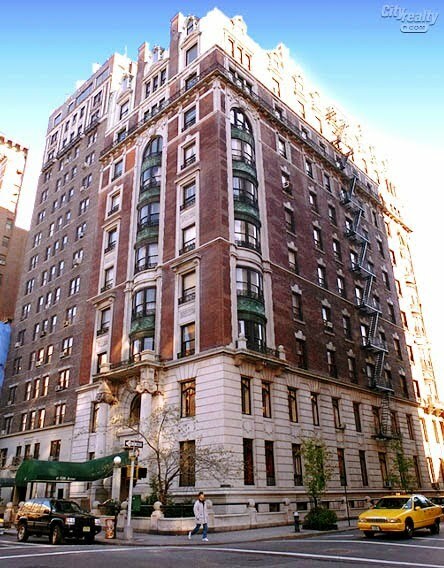 Rumor has it that Brando lived on the first floor, rear apartment. HIs window would have facxed the alley and he is supposed to have used that route to escape "visitors" he did not want to meet. I stayed 2 wks on the top floor with art appraiser/owner in either 93 or 94. So easy to explore the city from there.